Hello! Happy Wednesday! 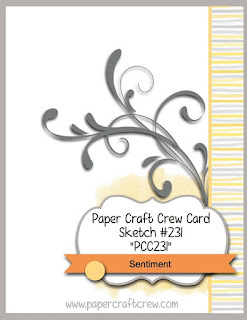 You know that Wednesday means another Paper Craft Crew Challenge and this week we have a fun sketch for you to try! 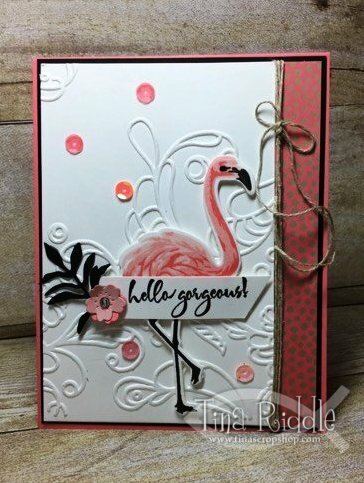 I absolutely adore how the layering flamingo turned out! 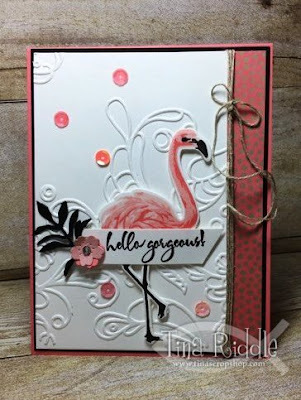 I used the color combination of Altenew Blush for the bottom layer, Stampin' Up! Blushing Bride and Flirty Flamingo for the 2nd and 3rd layers. The beak and legs were added with Altenew Jet Black Ink. I used a retired Stampin' Up! Florish Embossing Folder on the Background of 110# Neenah Classic Crest Solar White Cardstock. I believe that the strip of DSP that I used was from the Affectionately Yours DSP that I bought in a share. The flowers were cut from dies in Stampin' Up! Bloomin Heart Thinlits in Blushing Bride and Flirty Flamingo. The Basic Black Leaf behind the flower is from the Stampin' Up! Botanical Builder Framelits. I added a few loops of Natural Thread along the seam and tied it in a bow. I added this layer all to a 5 3/8" x 4 1/8" Basic Black Cardstock and mounted it on a Flirty Flamingo top folding 11" x 4 1/4" card base that was scored at 5 1/2". I added a few Doodlebug Bubble Gum Sequins to finish it off.